IU students, faculty and staff have joined in the fight to save the honey bee. Under a cloudless blue sky one June morning at the Hilltop Garden and Nature Center at Indiana University, Ellie Symes bent over a new hive the Beekeeping Club at IU had installed just a few weeks earlier. 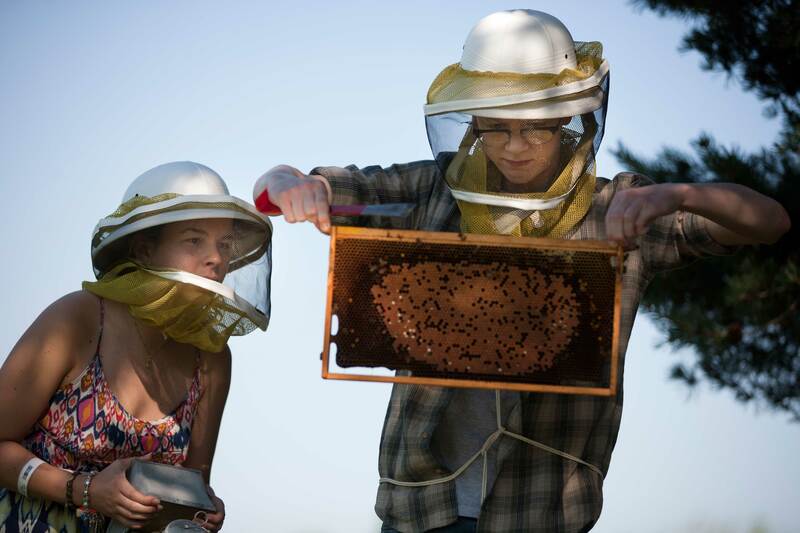 Ellie Symes, IU School of Public and Environmental Affairs graduate student, explains her love of beekeeping, and how she introduced her passion to the rest of the university. Symes is one of a growing network of IU students, faculty and Bloomington residents who have taken up the plight of the bees. Through Symes, dozen of students have joined the Beekeeping Club at IU to help establish hives on campus and raise awareness of the ongoing demise of bee colonies. Retired IU microbiology professor and longtime beekeeper George Hegeman has served as a mentor to students and continues to educate others in the area. 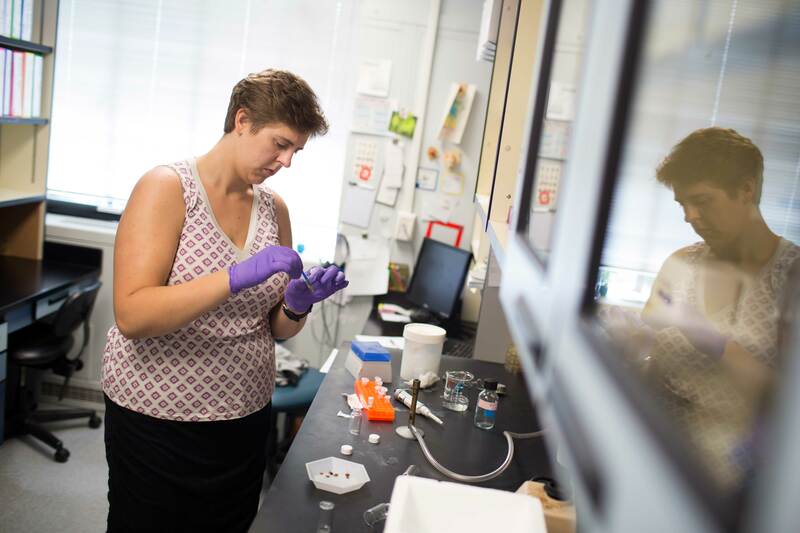 In the lab, IU researcher Irene Newton and her team continue to study the role that gut bacteria play in the honey bee's metabolism, how commercial practices may or may not affect honey bee health and what this might mean for the big picture of honey bee colony loss. “You can see the bees coming in and out so you know they’re active, and you can see the bees on the clover when you’re walking up to the hive,” said Symes, a first-year Master of Public Affairs/Master of Science in environmental sciences student at IU Bloomington who began beekeeping a few years ago. “But it’s not until you open the hive that you get the big surprises. 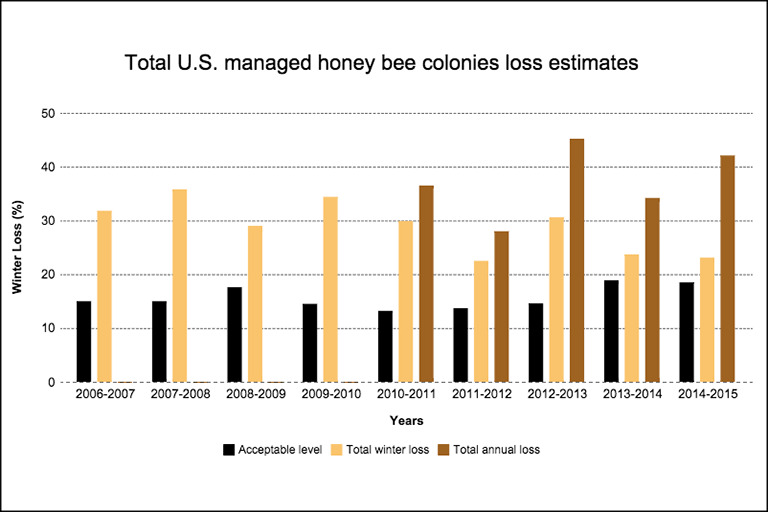 For the past decade, beekeepers in the U.S. and Europe have been reporting annual bee and hive losses that are considerably higher than what would be considered normal or sustainable. The term "colony collapse disorder" was coined in 2006 for the unexplained phenomenon of dying bee colonies. U.S. beekeepers lost more than 40 percent of their colonies in 2014-15 -- the second-highest loss since the Bee Informed Partnership -- a partnership with the USDA and the National Institute of Food and Agriculture that studies bee declines in the U.S., began recording losses nine years ago. In Indiana, the total colony loss last year was 49 percent. And honey bees -- the bees kept by beekeepers and used to produce honey -- are the most efficient pollinators; they enable the production of at least 90 commercially grown crops in North America and are responsible for adding more than $15 billion a year to the value of U.S. agricultural products. While native bees and other insects are also important, honey bees are the most prized because of their large colonies and their tendency to be “flower faithful," meaning they visit the same variety of flowers over and over, making them effective pollinators. Using a research grant from IU Bloomington’s Hutton Honors College, Symes received permission to install her first hive at Hilltop in the spring of 2014. While the bees did not survive, Symes' passion for beekeeping and for bringing hives to IU thrived. Beekeeping is an ideal hobby for someone who likes to be outdoors but doesn’t want to be tied down by daily chores, he said. It’s not terribly demanding -- “not like keeping chickens or cows." Symes and Hegeman talk about issues facing honey bees. But the phenomenon labeled colony collapse disorder has brought greater attention -- and even alarm -- to the plight of honey bees. The primary investigator of the lab is Irene Newton, an assistant professor in the department. She is also the faculty advisor for the Beekeeping Club at IU and a beekeeper herself, a skill she picked up from a colleague at Wellesley College, where she worked before IU. The paper shed light on the way in which differences between the diet of queen bees -- who feast on nutrient rich “royal jelly” -- and worker bees -- who consume “bee bread” -- leads to differences in the microbiome. The study also investigated common queen rearing practices and found that moving queen bees during development does not alter their microbial communities. 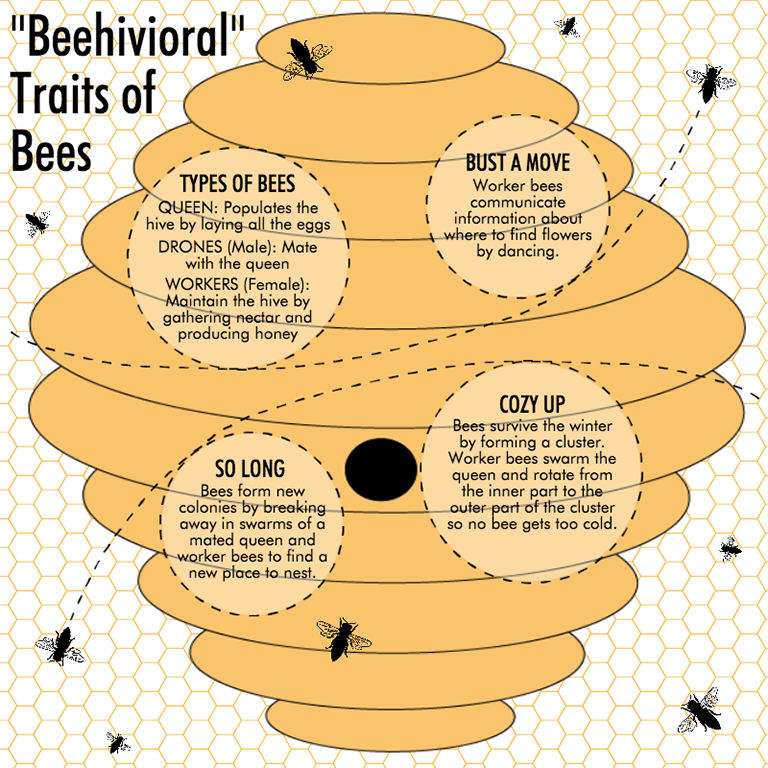 Shifting queens between hives is a common practice among commercial beekeepers, although they typically don't stray far from their home in nature. Irene Newton, assistant professor of biology in IU's College of Arts and Sciences, studies the honey bee microbiome and its importance to the lives of honey bee colonies. Newton said there is concern that the overuse of microbe-killing antibiotics could destroy good bacteria in honey bees along with the bad -- echoing similar concern about the high use of antibiotics in people. With breeding, Newton’s team is studying whether the practice of rearing baby bees using the genetic material from a few fathers is harmful. Queen bees typically mate with many different drones, giving birth to genetically diverse offspring, she explained. In another IU study, on which she continues to build evidence, Newton said she found signs that lower genetic diversity increases the number of pathogens in the microbiome of honey bees. 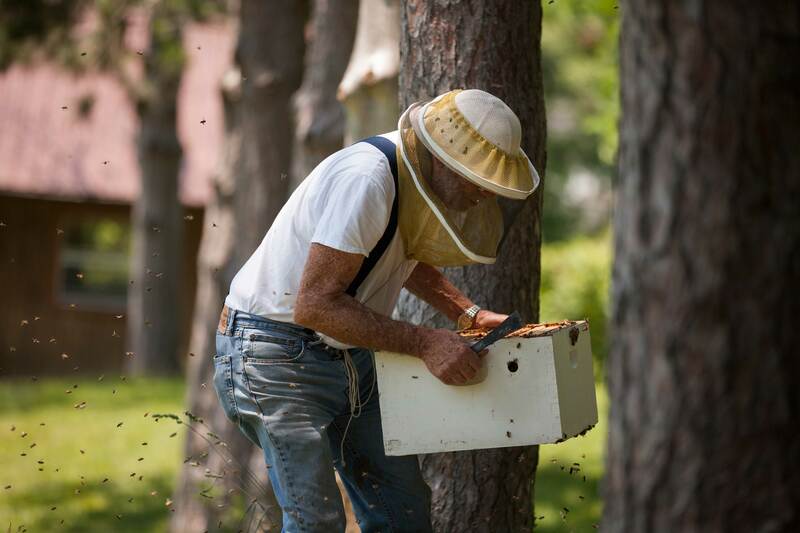 In addition to working in the lab, most of the members of Newton's team stay active in the field by helping maintain several research hives off Bayles Road on the IU Research and Teaching Preserve. Much like Symes' bees, they also experienced die-offs over the winter -- a stark reminder of the worldwide decline they’re hoping to play a role in solving. Regardless of the challenges, Symes' project continues to thrive. The Beekeeping Club at IU is up and running. This summer, two more hives were established at Hilltop Gardens; the hives are managed not only by Symes but by fellow students like Alex Sodeman. With Symes’ help, Sodeman has learned that bees pick up on nerves, so he’s worked to keep his anxiety in check when handling the small creatures. It’s just one of the many things he’s been learning this summer. “You do learn a lot when you are right up close next to them -- when they poke their heads up out of the frame, when they catch on that you are spraying smoke on them and that nothing is actually wrong, when they are at the front entrance of their hive and they stick their tails up to let the other bees know that this is an entrance," he said. "Also, if you pick up some frames you can see bees sticking their heads into the cells, and that means they are actually cleaning the cells and making honey or feeding babies. In addition to students, Symes’ activism has spread to others in the IU community. While working as an intern for Julie James, career advisor and career development instructor at IU’s School of Public and Environmental Affairs, Symes shared her passion for bees. They started out with one hive last summer. Like Symes, James and Blaney had numerous issues with their hive and ended up losing the bees last winter. They have started over this summer with three new hives they hope will become established and eventually lead to more hives. 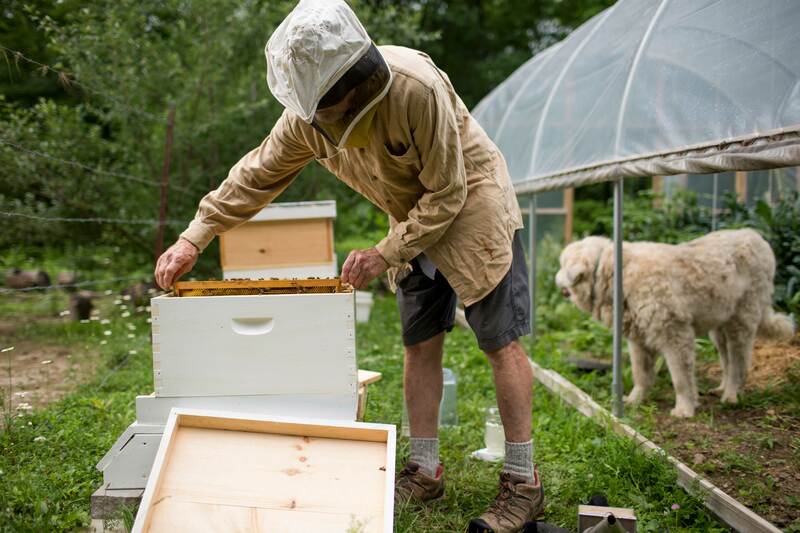 Also like Symes, in addition to simply being interested in bees, the couple’s main goal for keeping hives is to make a difference, no matter how small, on behalf of bees. It’s all about having a positive, proactive approach, Blaney added. But with that initial high came some disappointment when Wells and Kuntz opened up the second hive -- which had been thriving, other than a possible chalkbrood issue -- to find that the queen Wells installed a few weeks ago may have fled. While his studies at IU do not directly address environmental issues such as beekeeping, it was his “we can do something to make an actual change” mentality that pushed him to be more involved. 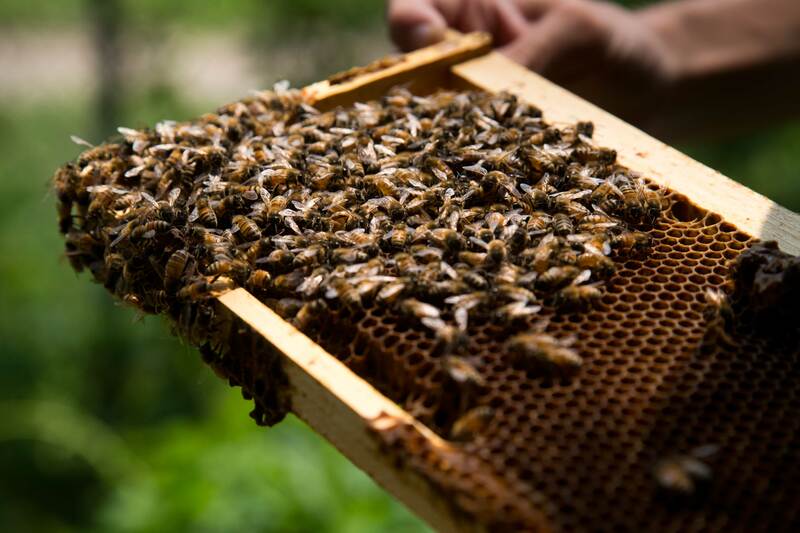 With two years left as an IU student, Symes is hoping not only to have established hives but to garner enough interest from students to continue to maintain them. This fall, she and her fellow club members plan to work with other student groups and IU administrators to push for a more bee-friendly campus. She’s also fielded interest from others on campus to potentially start additional hives outside Hilltop Gardens.